Provide the Calendar/Resource element with a title here. Click here for more information about defining titles. Any number of calendar plugins can be selected here that should provide the calendar or resource control with the appointments from the respective applications and data groups. 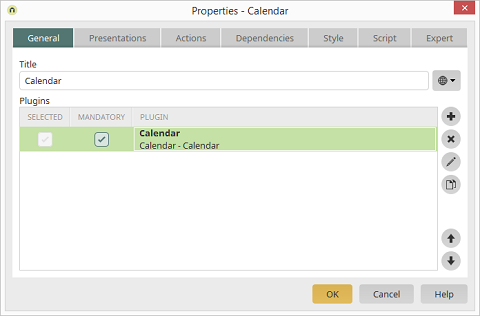 If the checkbox in this column is activated, the plugin is selectable in the browser for the calendar or resource element. More information about this can be found here. Preselected plugins, which are not mandatory, can be deselected by the user in the browser. If the checkbox in this column is activated, the plugin cannot be deselected by the user in the browser. The name of the plugin is shown here. Opens a dialog where a new plugin can be added. Removes the selected plugin from the list. Opens a dialog where the configuration of the currently selected plugin can be edited. Creates a copy of the currently selected plugin. Modifies the order of the plugins.